So pretty boring outfit today, but I thought it could be my belated celebration of 4th July...seeing as there's an eagle on my top and all. I really like America; I lived in Chicago for a year during university, I have family over there, I've been lucky enough to go on holiday there a lot...and American men are hot ha. I'm seeing one of my besties tonight and she is going to tell me all about her road trip around the states that she's just come back from - another fitting reason for the top. 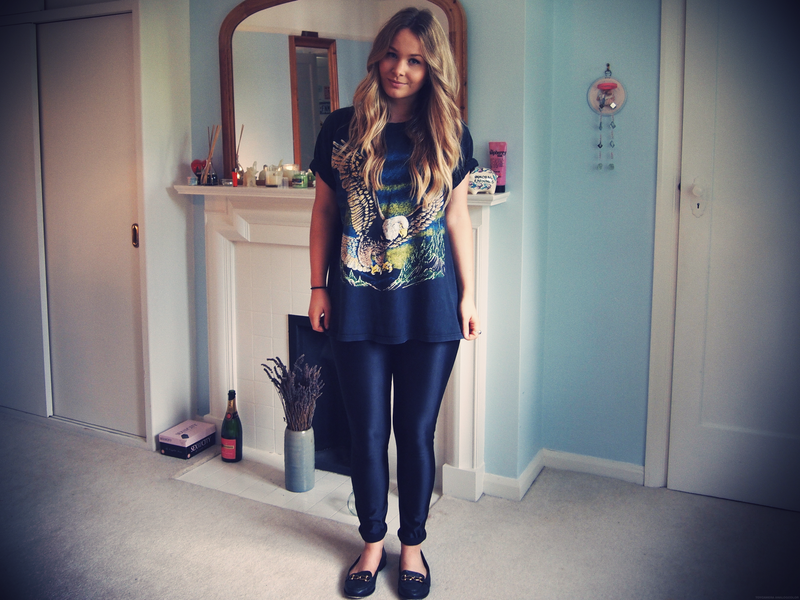 Another showing of the disco pants, they had their first outing in the office the other day. I'm still a little worried about wearing them, in the back of my mind I'm always concerned that my legs looks like tree trunks but life's too short really. After posts form MilkBubbleTea and Llymlrs (here and here) I decided to get some disco pant dupes from Glamourous (here). At only £29.99 I thought they were a bargain and I looked at their composition (90% acrylic and and 10% elastane) and saw that it was same as the AA ones. So I thought they would be good to try out. For me however, they just don't cut the mustard. They are more like a charcoal colour than black and are so much thinner than the AA ones. They are also much shinier so look more daring that the AA ones - I wouldn't feel comfortable wearing them during the day, much harder to wear casually. So all in all, I'm sticking with my AA ones. I have seen though that the Glamourous ones are now sold out, so if anyone is after a size 10 pair or a size 12 pair of the black disco pant dupes I'd be happy to sell them (don't worry, just at face value - not going to go all tout-y on you). If you are interested, give me an email (lvparker90@gmail.com) or tweet me (@louiseprkr). So anyway, hope everyone has had a nice weekend. It's my graduation on Tuesday (apparently it will be in the rain) so expect a cheesy shot of me in my Harry Potter style robes and geeky hat some time soon! This is such a lovely casual outfit - definitely going to have to purchase some disco pants if I ever manage to shift a few pounds. love this outfit :) I think you should keep the disco pants as they look incredible on you! Ooh the disco pants look really good on you! I really fancy a pair but not convinced they'll look good on me, plus I don't think I can justify that much on them :-S eek!